Don’t let your emotions to ruin your makeup on your life’s biggest day- Wedding. 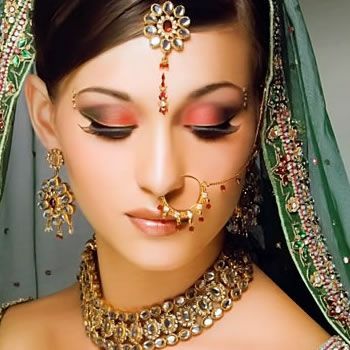 Avoid a makeup coalesce due to sweat, tears or rains by getting yourself a professional waterproof bridal makeup artist. While you are deciding on your bridal makeup you certainly must have come across a lot of options that are recent in trends and suiting your needs the best. Waterproof bridal makeup has now made headway to match up with every bride’s dream to look the best for hours on her wedding day. This kind of makeup is best for all seasons (winters, fall, monsoon, and summers) and can do wonders if you pick fine quality makeup products. Be careful of waterproof makeup products that can leave bad results due to low quality, so make sure that you have a pro makeup artist with world class quality makeup products and tools in your connections for your wedding event. Waterproof eye makeup is the most essential thing in your bridal package that intensifies your eyes beautifully. As a bride your mascara, eye shadow, eye liners, gel eye liners, eye lashes and eye brow colour all need to be just perfect and must turn out well with your wedding dress colour before you walk in the aisle. Waterproof bridal makeup has a lot to offer over normal makeup such as long-lasting glowing effect, best for all seasons and for all skin types, versatile range of high end waterproof beauty products and many more. Removal of waterproof makeup is even simpler by applying good cleanser or olive oil to polish off. I like very much waterproof bridal makeup because Waterproof bridal make up has a lot to offer over normal makeup such as long-lasting glowing effect, best for all seasons and for all skin types, versatile range of high end waterproof beauty products and many more. Removal of waterproof makeup is even simpler by applying good cleanser or olive oil to polish off. Wow this looks so good! Haven't heard of this waterproof makeup before but I'm impressed and am very tempted to try it! Love your ideas.